Don’t get over-excited. You live in the Parliamentary constituency of Hertsmere. The excitement of General Election 2015 is going to largely pass you by (as it will, of course, for most electors in most constituencies). According to this chart on the Electoral Calculus web site, ours is the 87th least marginal Conservative seat in Britain. It would take an upset of a never-before-seen magnitude to cause Hertsmere to change hands on 7 May. So relax. However you vote, you already know the outcome. The incumbent MP – Conservative James Clappison – is standing down at this election. His replacement as Conservative candidate, Oliver Dowden, will, as night follows day, take his seat in Parliament on 8 May. So, what is there left to say about Hertsmere? Well, there are only three other candidates so far declared. No candidates from the Greens or from the BNP, both of whom stood in 2010. They still have time to declare their candidacy, though, and so do you, so if you’d like to stand yourself, you have until the close of business on 9 April to submit your nomination. It’s not a straightforward process so you’ll need to get your skates on – and there’s the small matter of the £500 deposit. The Electoral Commission’s advice for candidates and agents is very comprehensive. Bowler is a late entry. She’s on the Your Next MP web site and listed on the Liberal Democrats web site but doesn’t have her own profile yet. According to the JC, she’s too busy to campaign. The Liberals polled a respectable 8,210 last time round (the candidate was Anthony Rowlands), just behind Labour. A 27 year-old Borehamwood Councillor who’s been a Labour member since he was 15 and a councillor since he was 21. He’s, on Twitter. Labour’s 2010 candidate, Sam Russell, polled 8,871, putting him in second place, over 17,000 behind the Conservative candidate. Hertsmere’s Conservative candidate is a member of the party’s inner circle: Deputy Chief of Staff to David Cameron and an experienced SPAD. A local man, born and brought up in St Albans and living there now, he apparently won the candidacy by a landslide, taking over 50% of the internal Conservative Party vote in the first round, which is very unusual. This Spectator article names him as one of ‘David Cameron’s secret A-list’ of candidates anointed by the Conservative hierarchy. He has a web site and is on Facebook and Instagram. 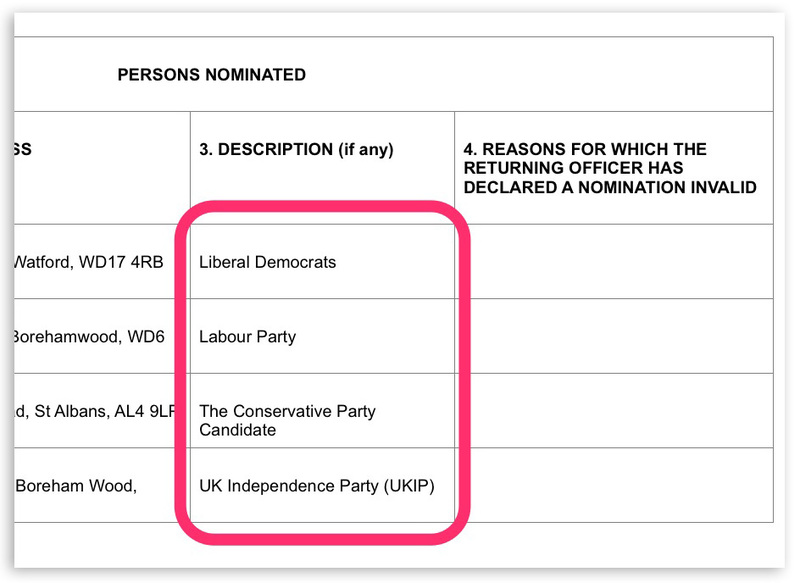 Interestingly, your Ukip candidate was also once a Borehamwood Labour councillor. Ward joined Ukip in 2013, having been deselected by Labour in 2006. He was a Labour member for 45 years. He’s also chairman of Hertsmere Ukip. Although our own election is likely to be on the dull side, the General Election itself looks like it’s going to be anything but, of course. The BBC’s General Election homepage will probably be a good starting point (declaration: I work at the BBC). All of the papers have set up election portals, of course. The lead story on The Telegraph’s today is about reactions to last week’s seven-way TV debate. The Guardian’s lead story is about a Conservative defector to Ukip. Among the pollsters, it’ll be worth keeping an eye on YouGov’s constituency page for Hertsmere. Using a rolling poll of approximately 150,000 UK electors (751 of whom apparently live in Hertsmere) they’re currently projecting a Conservative vote in the range: 41.7-54.6%. The fact that US polling ninja Nate Silver (founder of the FiveThirtyEight data journalism site), is forecasting the UK General Election has to be interesting, although he’s actually using the work of a group of UK academics to do so. His current prediction is for the Conservatives to take 283 seats against Labour’s 277. In this interview, though, he cannily concedes that accurately forecasting this year’s UK General Election will be very different from doing so in the more stable two-party context of the USA. UK Polling Report is an always-fascinating blog from Anthony Wells, Director of YouGov’s political and social opinion polling. He looks at all the UK polls and specialises in debunking party and media spin. His own poll of polls currently has the two main parties tied on 34%. Follow him on Twitter too. The BBC News Poll Tracker uses multiple UK opinion polls to measure support for the main parties during the campaign. I’ll keep this blog up to date during the campaign, with links to useful resources and, as they arrive, details of the candidates’ policies. If any hustings occur locally, I’ll link to them here too. If you learn about any resources that I ought to be linking to here, leave a comment or email me. Follow @RadlettWire on Twitter for regular updates and the very handy @RadlettNewsBot for automated news about Radlett and the constituency. I’ve created a Twitter list for the Hertsmere candidates. It’s not much of a list: it has one member. Results of the 2010 general election in Hertsmere (PDF). All the Hertsmere general election candidates, listed at YourNextMP.com. Remember, in Radlett this year, we’re also voting in elections for Aldenham Parish and Hertsmere Borough councils on 7 May. More about these votes on this Hertsmere page.